Based around the very successful Singer 20U series of machines, here is the current model. Manufactured to a very high quality. Knee Control lifts the Presser Foot leaving both hands free to handle the work. Knee Control can also be used to control Zig Zag Width for embroidery applications. 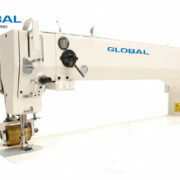 We Import & distribute these machines on a Direct Basics , which means we can offer you GREAT PRICES. The 20U53 is an ideal addition to any sample room, alteration or dry cleaners shop. Also used extensively in Craft Workshops for applique, embroidery etc. Versatile and easy to use. Accepts all standard lockstitch format accessory feet. Supplied with FULL accessory kit, including Straight Stitch Conversion Kit. 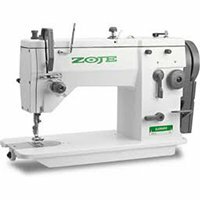 20U53 offers maximum stitch width of 9mm for extra wide embroidery and tackling operations. Long Arm 760mm Length X 250mm Depth. Supplied with Puller for strong & steady feeding. Capable of sewing 13 layers of 15 ounce polyester sail cloth with easy. Large barrel shuttle hook to take the thickest / strongest of thread.